Look...I don't know if this is makin' money for these guys (and christ I hope it is).....but I was trying to navigate this website and I feel like I just got off the Tilt O' Whirl at the county fair. There's Times Square....and then there's Pigeon Forge. 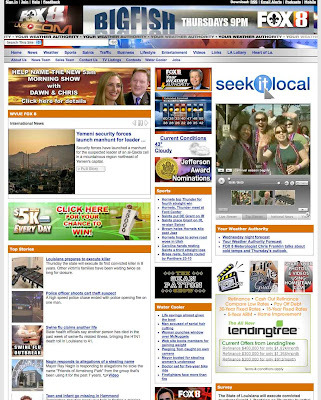 My point is, I think Fox 8 should reconsider their homepage, unless of course this is really workin' for them. And by workin' I mean turnin' bills. I just feel like I've been raped by pixels....ooooo....new word for Urban Dictionary! Pixelpoked? Help me out guys. Sheesh! You didn't actually expect to find NEWS on Fox's website, did you? If you add it up, there are more promo ads for Fox 8 than paid ads from other sources. Guess it's not making as much as they hoped! back in the day we referred to a site like that as an "angry fruit salad"
The Dambala post on this was so good, I just couldn't respond. Ch. 8 does not direct-link their videos, which is nuts for so much apparent trouble and expense. Then click on "Aaron Broussard interviewed by Val Bracy" for a priceless piece of local news interviewing. Rare, rare, rare in this town. Val Brady might be a name to remember, and isn't this station getting lee Zurich? Ch. 115 has rebroadcasts and they sure seem to be trying to get some viewers with some good reporting.